For those of you know don’t know what Brazilian Jiu Jitsu is, here it is in a nutshell. It is a grappling martial art, meaning the focus is on controlling your opponent on the ground. BJJ is similar to wrestling, but the crucial difference is that instead of the endgame being to pin your opponent’s shoulders to the ground, Jiu Jitsu practitioners master submissions that would incapacitate an opponent, including chokes, arm bars, and leg locks. If you’re like the majority of the world that has never tried Jiu Jitsu, you need to. Today. It will change your life (cheesy, but true) and here are seven reasons why. 1) A valuable skill that requires strenuous exercise. Let’s start with the obvious. Brazilian Jiu Jitsu is a sport, and it requires a level of physical strength, stamina, and dexterity you’ll be hard-pressed to find anywhere else. Unique in the martial arts world, Brazilian Jiu Jitsu sparring practice is trained without holding back, except there is no striking in Jiu Jitsu. You use your full range of motion and strength, making for the toughest workout you’ve probably ever had in your life. Instead of going to the gym with the sole purpose of building strength and stamina, build strength and stamina naturally through learning a martial art that you’ll most likely want to do for the rest of your life. 2) Find community anywhere in the world. 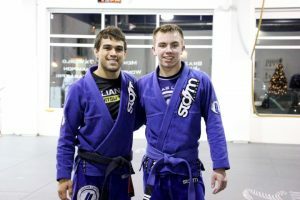 There is an odd-yet-awesome sense of community amongst BJJ practitioners. When you travel anywhere in the world there is a strong sense of camaraderie. 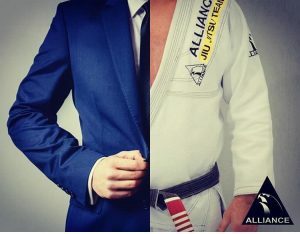 As a member of Alliance, the most successful Brazilian Jiu Jitsu team in the world, joining the Lucas Lepri Brazilian Jiu Jitsu Academy in Charlotte, NC will instantly give you access to a worldwide network of teammates. These people are literally thrilled to have you visit their gyms, and will treat you like an honored guest whether you train there during an overnight business trip or an extended vacation. 3) Effective self defense (especially against bigger opponents). Almost all real-life fights, like muggings and sexual assaults, end on the ground. The shocking reality is that if you take away a person’s ability to kick and punch by pinning them to the ground, most people panic and flail totally ineffectively. Because of this, when martial art practitioners who specialize in striking face an expert Brazilian Jiu Jitsu practitioner, they usually lose the fight the moment it goes to the floor. 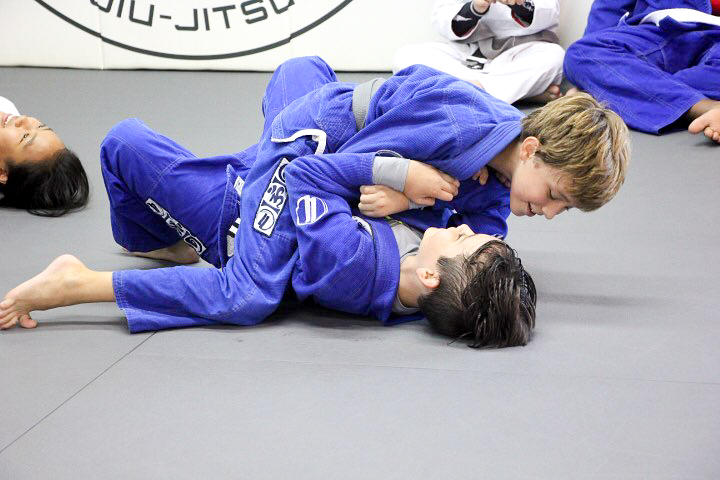 Skill – not size – is the major deciding factor in BJJ fights. Take a few minutes to watch a couple of classes tonight at the Lepri BJJ Academy (we are right nearby, in Matthews!). There, you can witness first-hand the reason why Brazilian Jiu Jitsu is considered one of the most effective forms of self defense for both men and women. 4) Learn how to keep a level head under extreme stress. In the BJJ world we have an adage about beginning practitioners: “The white belt is about learning to survive.” Learning to work through the panic of what your body perceives as very real danger is essential if you want to progress from a flailing newbie to a skilled fighter. In order to execute the appropriate sequence of responses you need to develop incredible stress-management skills. These skills transfer to every aspect of your life. Students report that learning to problem-solve under stressful conditions enables them to make similarly smart and effective decisions in their everyday life, at home and at work. 5) Develop patience and surround yourself with patient people. If you’re looking for the quick satisfaction our world has come to expect from martial arts – go to class, learn 5 forms, take a test, get your belt… you’re in the wrong place. In our modern era where it seems that instant gratification is the ultimate measure of excellence, Brazilian Jiu Jitsu provides something you can’t easily find anymore: arduous, challenging, and extremely meaningful measures of success. It takes the average Brazilian Jiu Jitsu practitioner ten years to get their black belt. Ten years of consistent training. So get ready to work hard for your belts. There is no shortcut to your blue belt or beyond. Develop the skills. Put in the work. Improve your technique. That’s how you advance. 6) Gain a level of self-confidence most people never achieve. Of course that doesn’t mean that practicing BJJ means you should pick fights. But knowing that you are not in physical danger really does change the game. All of a sudden your macho, bullying boss at work seems a lot less threatening. As a woman, walking alone at night doesn’t make you feel helpless or vulnerable. 7) Get comfortable with losing. The fastest way to lose a harmful ego. There is no place for an ego on the mats. There is no time from the day you step onto the mats to the next 50 years of your life where you will be certain of victory. In Brazilian Jiu Jitsu, there will always be opponents who seem like they are pinning your flailing body down with apparently no effort. When you tap out for the third time in that five-minute sparring round, you’ll both share a smile, a good-natured slap of the hands, and go at it again. It is a humbling experience without a doubt. In a gym led by famous athletes, like Lucas Lepri’s gym in Charlotte, you’ll get more than your typical share of people who will consistently have stronger techniques than you. Be thankful. Learning to lose may be one of the most important lessons you learn – not just on the mats, but in your life. It is okay to realize that you still have more to learn. 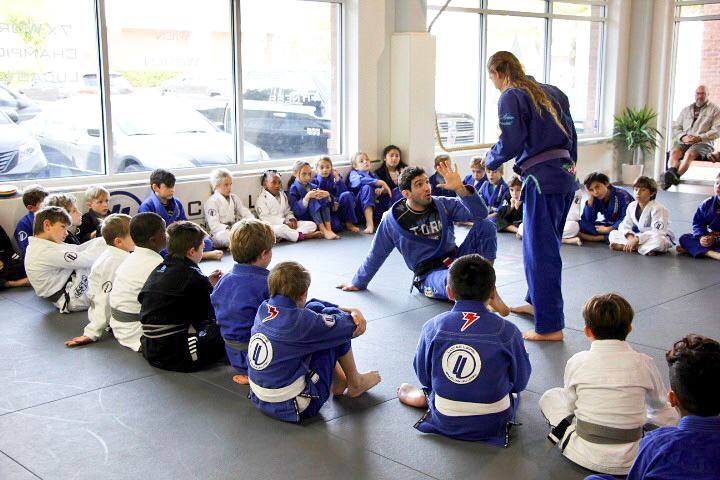 No one puts it better than author and podcaster Tim Ferriss: “You are the average of the five people you most associate with.” At the Lucas Lepri Brazilian Jiu Jitsu and Fitness gym, you will find the highest caliber of athletes as well as the most welcoming community. Surround yourself with excellence, with worthy opponents, with champions…and you will inevitably become those things too. So, if you in the Matthews or Ballantyne area, get in your car and come visit us at the Lucas Lepri Brazilian Jiu Jitsu Academy! 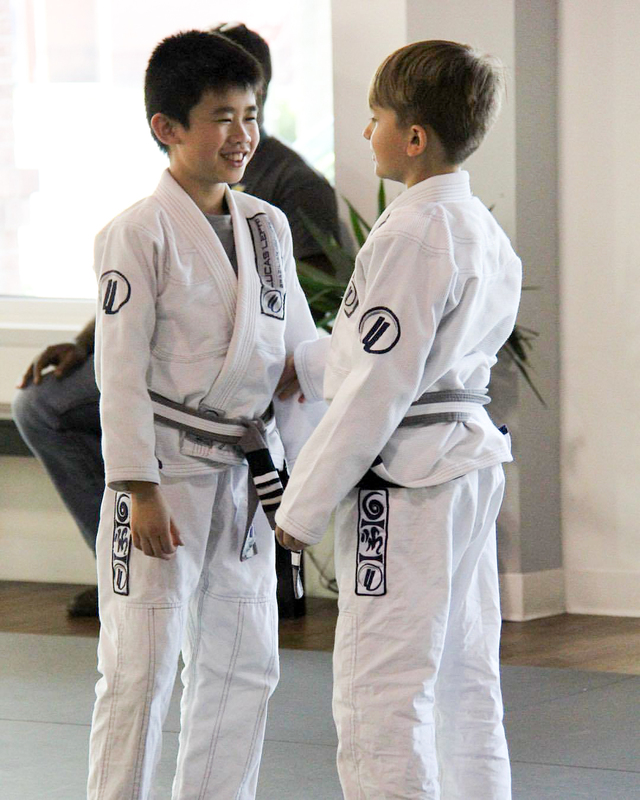 Today is the perfect day to start your Jiu Jitsu journey. This year for Valentine’s Day, we thought we’d let you meet a few of the couples training at the Lepri Brazilian Jiu Jitsu Academy! 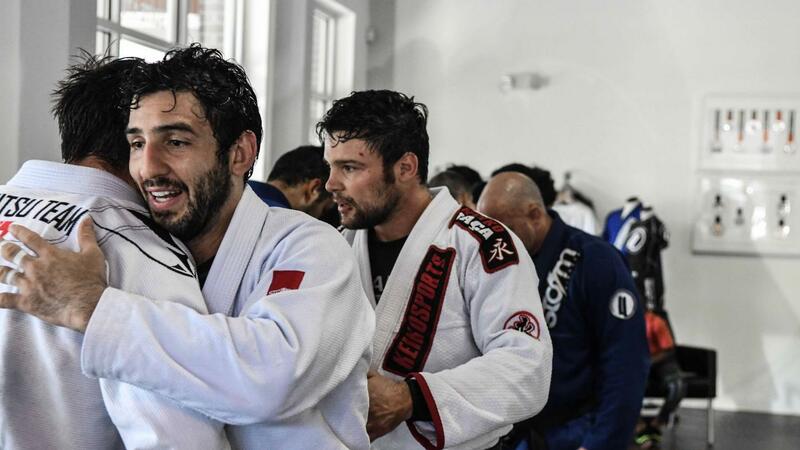 We asked couples what it was like to train BJJ together. Here are responses from just three of the many couples and families training at our gym. 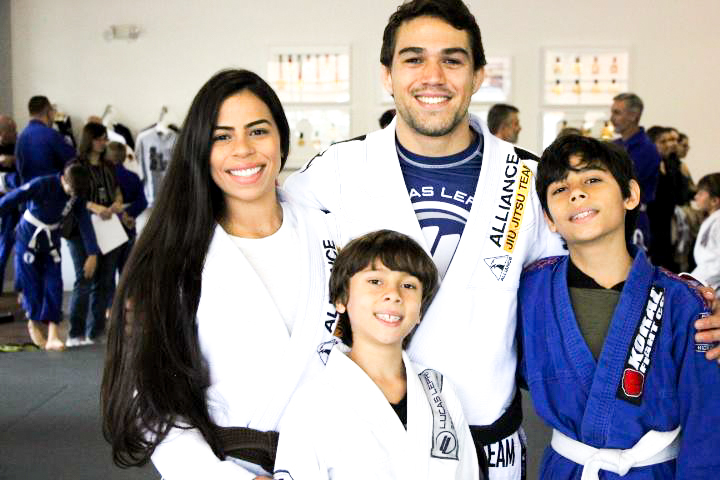 In this family, mom, dad, and kids train at the Lepri BJJ Academy! Joel started training first, and trained for almost three years before Anna joined. 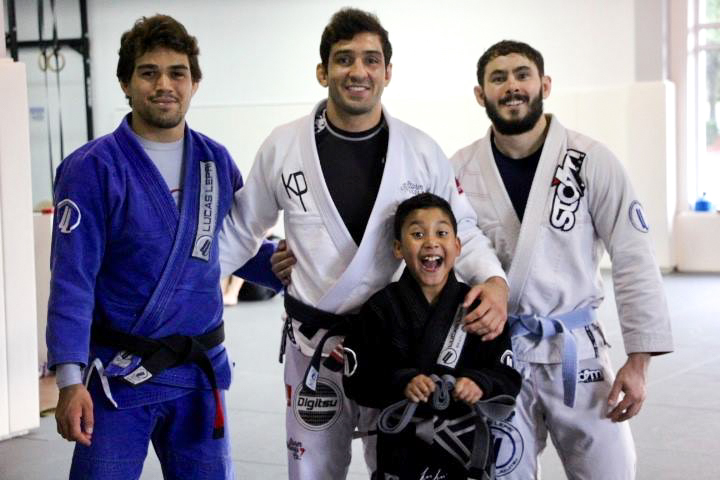 Now, they both love training together, and enjoy a sport they can share with their kids! 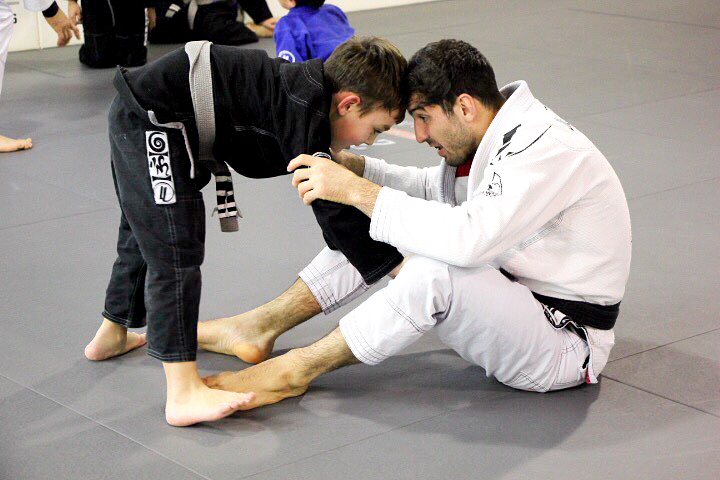 Our very own instructor Freddy loves sharing the mats with Taísa and their kids! Freddy started training first, still in his teens. In fact, after years of training BJJ at different gyms, this is the first time they are training at the same gym here at the Lucas Lepri BJJ Academy! 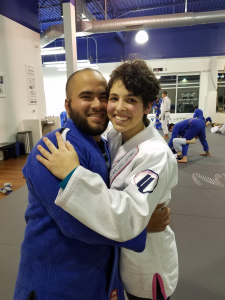 This couple actually met on the mats, and have never looked back! Rod started training first, about three years before meeting Adriana when she joined the academy where they trained in Nicaragua. 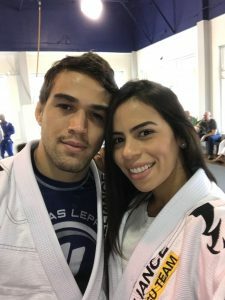 What is it like to train BJJ as a couple? We asked our students a few questions about their experience training Jiu Jitsu as a couple, and here’s what they said. How did you start training together? Joel : It took some time for [Anna] to warm up to the idea [of training]. But what pushed her into it was watching our two oldest boys compete in some local tournaments. She is very competitive and fiesty, so naturally she fell in love. What do you love about training together? 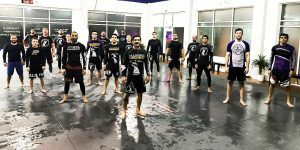 Taísa : We love many things about training together, not just the benefits of training, but everything that Jiu-Jitsu covers. We learn from each other, we share expectations and a passion for Arte Suave (the direct translation of Jiu Jitsu), we have excellent quality time together and we are happy to share the mats. It’s great to have someone who understands and shares your profession or hobby, understanding the joys and difficulties. Anna : We love training together because it is fun and we keep it playful and always laugh. Rod : Just the fact that something I love so much, Jiu Jitsu, is something we can do together is so awesome. Not many women train Jiu Jitsu, especially not where we started [in Nicaragua]. What do you hate about training together? Joel : She does not like the fact that she can never pass my guard or submit me. Adriana : Rod does this really annoying thing I hate, and I tell him I hate it and he still does it. When we roll I go really hard because I need to tap him out! And I get a lot of good submission attempts on him, and make him work. When he’s been fighting for his life for a couple of minutes and he finally passes my guard and gets me in side control, he just stops there, squashing me, and gives me a kiss on the cheek. It infuriates me, and I’m spazzing out trying to get out, and I can’t. That little kiss just seems to say “aww, you’re so cute when you fight,” and I am trying to be everything but cute when we fight. Funniest thing that has ever happened to you while training together on the mats? Adriana : Part of my plot to get closer to Rod when we first met was to challenge him to this BJJ battle. We made these funny specs videos of both of us with our fight faces on, and I made this face-off poster and posted it all over Facebook. I’m actually a little embarrassed about it now. But it worked, because after that fight we went out to lunch and that was the day of our first kiss! Taísa : The funniest thing is not exactly on the mats, but when we study positions at home on the carpet, it’s not very comfortable but it sure is funny. 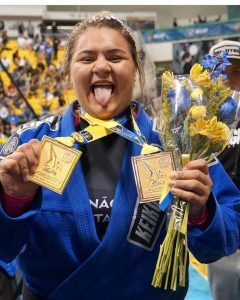 Our athlete of the month is a 2 time World IBJJF Champion, 2 time Pan American Champion, 2 time European Champion and 2 time Brazilian IBJJF Champion, and none other than Tayne Porfirio! With titles such as these she needs little introduction and we are very happy to get a little more personal with this inspirational athlete! Tayane hails from Rio de Janeiro, Brazil and trains under Gigi Paiva on team Alliance. Not only is she amongst the most talented black belts, she has earned her prestigious titles at a mere 22 years old! We wanted to know more about his young champion and her story. How does she feel about all of her titles, and what inspired her to begin training in the first place? Tayane answered humbly that looking back now she sees a story that she never thought that she would be a part of. She began training jiu jitsu because her sister was already training and she wanted to lose weight. Little did she know that soon her reasons would become less and less about the weight and more about learning respect, love and more about herself through great experiences. Tayane is very active on social media and finds herself taking a stand on several controversial issues. She is a very passionate advocate for women’s rights in competitive jiu jitsu. She recognizes a stark contrast in the amount of women who train as opposed to those who compete. She believes that the lack of women competing has a direct correlation with the lack of women’s rights in the sport. She is trying to fight this buy activley encouraging all women to lose their fear of competing and show that women are just as capable as high level competition as men are. Recently Tayane was announced by IBJJF as the top ranked black belt female for the 2017 competitive season. This came as no surprise to fans of jiu jitsu as they watched Tayane dominate at prestigious competitions. Her unblemished season included double gold at Europeans, Pan Ams, Worlds, and Brazilian as well as the Gracie Pro this past month. A remarkable feat to accomplish and a dream of many athletes. We asked her about her training and what she does to get ready for those big tournaments. Tayane said she pushed forward with a focused mindset. She said she even pushed herself too much between the tournaments, not stopping from Europeans until Worlds. That her hard work and mindset definitely paid off. Because she is such a strong advocate for women we asked her about some of her favorite new black belts fighting alongside her. She mentioned some of her favorites are Talita Alencar (Alliance), Bianca Basilio (Almeida BJJ), Nathiely de Jesus (PSLPB), Jessica Flowers (Gracie Barra), Ana Carolina Vieira and Thamires Aquino (GFTeam) and Nivia Moura (Ribeiro BJJ). She says that all of these women are extremely talented but that there also a lot more women out there that deserve to be recognized as an important part of the growing women’s jiu jitsu competitive scene. 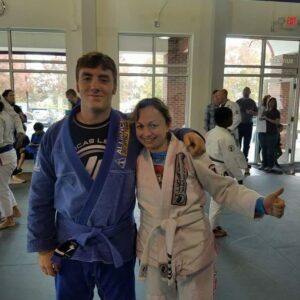 Tayane is an inspiration for many women in the jiu jitsu community. For those hoping and working to follow in Tayane’s footsteps she leaves this encouraging message, “Don’t give up on your dreams. It may be a hard path to follow but giving up will cost more in the long run. Chase what you want and see it as a possible thing to achieve, leave it up to God to make up for the rest”. This seems to be a common issue for those that go to work during the day and then the gym to train after. We live in a busy and stressful world. Everyone tries to accomplish so many things at the same time. It is normal to be tired and drained before you even arrive at the gym. Please don’t let this be the reason you decide to skip training for the day! Whether you are a veteran jiu jitsu practitioner or a newbie, you know how beneficial the sport is in your life, or you wouldn’t be doing it! Even though you may have had a stressful day, once you step on those mats it all magically disappears for the hour or two you are there. Rather than worry about finances you are now worrying about surviving the dreaded Bow and Arrow Choke. Instead of feeling down about life circumstances you are now feeling pumped that the guard pass you’ve been working finally worked! One helpful tip when you are feeling down and have no energy to train is to think about your training partners and the sacrifices that they have to make to be there training by your side. There are those with little kids, who have to haul them to the gym to be able to train. There are students that do not live close to a gym and have to drive many miles to train. There are people with difficult work schedules and full time students that still manage to find time to make it class. Use your fellow training partners as examples and as inspiration to help you find more motivation to train. Another thing you can do for self motivation is to think about where you want to see yourself in your jiu jitsu journey five years from now. 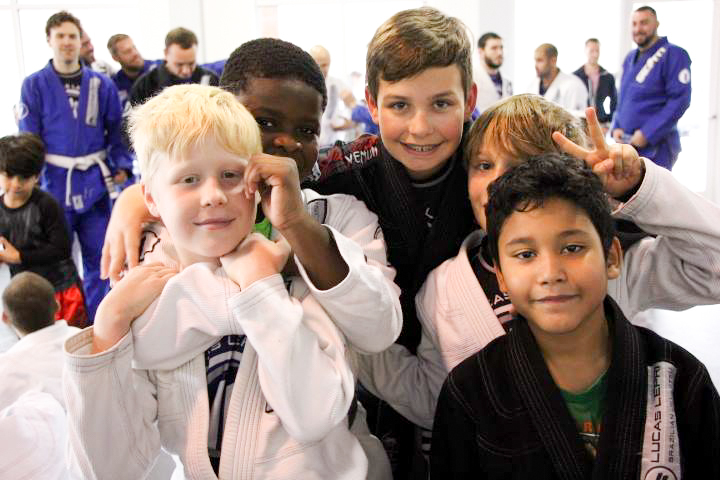 Maybe you want to be more active in competition or a have a shiny new belt around your waist? Do you see yourself in better shape or maybe see that your friendships and gym family has multiplied? 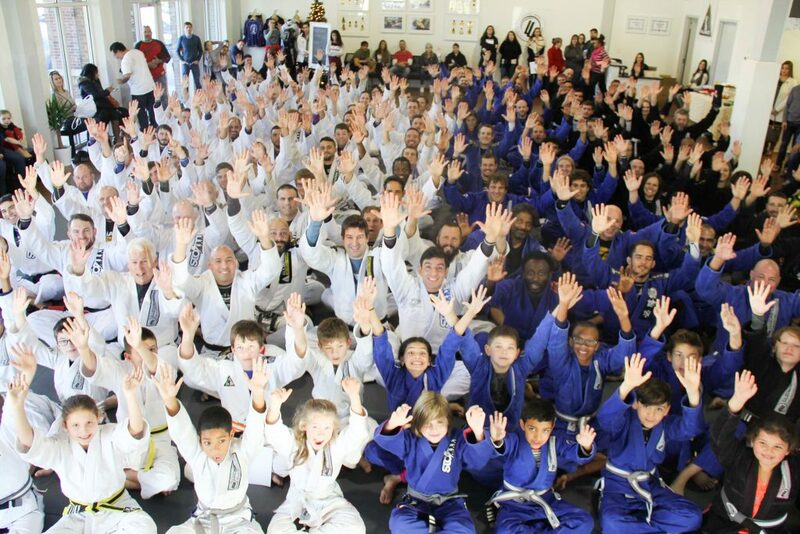 What experiences will you be able to share with the new white belts in five years? This thought process can be a powerful motivation factor. You cannot create this moments by skipping out on training! Make your busy life a little easier by being prepared for your training week. Set a goal of many classes that you will attend and stick to it! Have your gym bag prepared and ready to go in your car so you don’t find yourself scrambling to make it on time. Pack a healthy lunch and snacks to fuel your body properly throughout the day. Drink plenty of water and if you need a little boost, some tea or coffee. If you are the competitive type, make a list of upcoming competitions and sign up! Let your instructor know your goals. He is there to help and he will definitely notice if you are missing classes before the big day! Finally, remember why you started your jiu jitsu journey in the first place. Remember the excitement you felt and why you kept coming back. The gym is a place to have fun and let go of the daily life stressors. Enjoy your journey and keep pushing forward. The end result will be priceless. We want to know! What are YOUR tips for being consistent and full of energy before class? After an amazing performance at the Pan American Championship in March this year, the time had come for our head coach to defend his World Championship title in the lightweight division once more which was not an easy task. When looking at the brackets in his category, it was evident that it would be a war from the start. Regardless of the challenge, there was no doubt the preparation and drive Lucas Lepri had for this event. Consequently, his actions held true to his game plan; with a fierce game rarely seen, Lucas presented us with one of his best performances of all time: effective passes, beautiful sweeps, flawless transitions, relentless submissions, and world class take-downs. If there is one major goal in the sport of Jiu-jitsu, it is to become World Champion. An even harder feat is to not only win the title but to remain a champion once at the top. 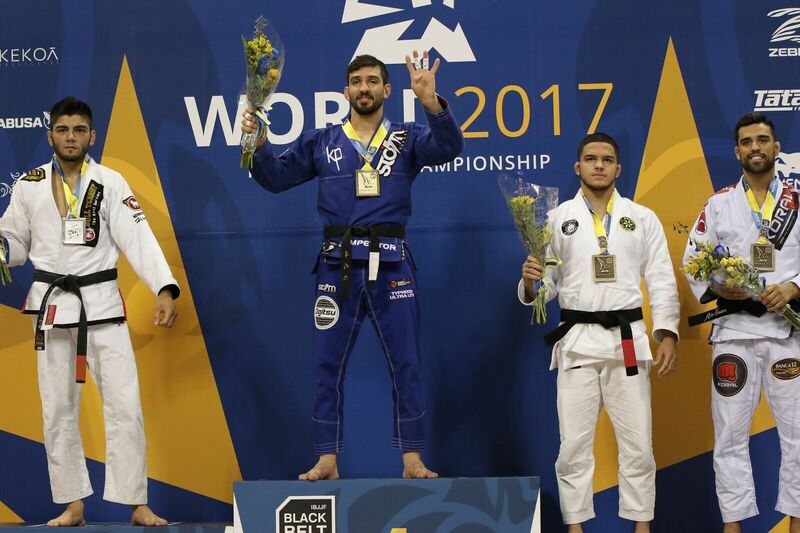 After winning his fourth IBJJF World Championship title, Lucas entered the IBJJF’s Hall of Fame. The Hall of Fame selection is made up of a select group of athletes who have accomplished the prestigious honor of winning at least four World Championships in the IBJJF organization, which is known to be the biggest and most legitimate organization in Jiu-jitsu competition. If that isn’t impressive enough, Lucas, once again, not only won another big tournament but did so without a single point scored against him. The same thing happened in the 2016 Worlds and 2017 Pan Ams. Lucas did so with complete support from his students, friends, and family. This is what the Lucas legacy is all about: hard work, preservance, commitment, teamwork, and family. The Alliance team left their stamp this year at Worlds. Along the light weight title with Lucas Lepri, rooster weight Bruno Malfacine won his 9th World Championship, and Rubens Charles “Cobrinha” conquered his 5th World Title, and Nicolas Meregalli had an outstanding performance as a fresh Alliance black belt, winning the title of the heavy weights, and Tayane Porfirio also confirmed herself as the favorite between the women by being the owner of open division and super heavy weight. The 2017 World Championships left us with so many good stories; the victories will be remembered; and the defeats will teach us to be humble and not ashamed of trying again and again. We all know that we walk together as a team, and this is just the beginning. By looking at Lucas as an example, we can follow our dreams and keep working hard. Anything is possible! After two grueling weeks of training the IBJJF World Jiu Jitsu training Camp at Lepri Brazilian Jiu Jitstu HQ has commenced. Camp is a unique training experience and something everyone participating in this sport should experience. While training in Camp, we are not just learning and perfecting technique and strengthening our bodies, we are conditioning our minds and learning more about ourselves. Guided by Master Lucas Lepri, we were encouraged to try our best, repeating different positions until they become our natural and instinctual movements. We completed several rounds of training with our teammates often doubting that we could make it to the end of that round, or the next one….or the next one It was inspiring for all of us to look around and see that even though we were all reaching the point of exhaustion, no one was giving up. We were in this together. Following in the footsteps of our Master, whose hard work and dedication to the sport is an inspiration for all us. He trained exhausted alongside all of us, being attentive to our hard work and showing us that yes we can do this and yes, it will be worth it. When the physical pains turned into mental pains and were threatening to overtake us, Lucas was there to support us. He showed us the way to be strong and how to train with a purpose. Teaching us to know when the proper time to push was and the times to preserve our energy. Even in the midst of intense training we learned to watch for our mistakes, and learn from them. Not only was he giving us a physical game, but a mental one as well. Teaching by example on how to remain positive and not letting negative thoughts control our emotions. Teaching us how to remain focused and have willpower but at the same time being compassionate and understanding with our teammates. Asking for help and helping each other out with technique or competition advice created an unshakeable team bond. One of the benefits of training at Camp is the opportunity to learn from previous World Champions from all over the world. Knowing that they have been through this journey and succeeded gives us hope and determination. Being able to turn to them for advice and help is a great honor. Tarsis Humphrey and Bernardo Faria were a great asset to our training camp. Lending us support and technique and setting a great example of hard work and dedication. 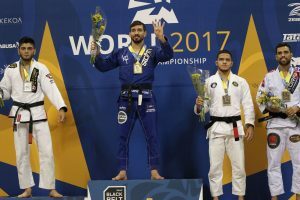 In addition to Tarsis and Bernardo, several athletes of different belt ranks came from different parts of the country to make Lepri BJJ HQ their home for two weeks. The visit of the FloGrappling crew was a highlight of this Camp as they came to document our preparation for Worlds. It was an honor to be amongst the chosen academies by Flograpping, as they are doing great things by popularizing the sport of jiu jitsu. Make sure to check out the links at the bottom of the article to see the photos and videos published by Flograppling! After a strenuous two weeks of morning and evening training sessions, strength and conditioning and mental preparation, the Lucas Lepri team is ready to take their stand at the World Championship. Armed with gratitude for this opportunity as well as the certainty that we have trained our best, we are ready battle! Make sure to follow along and support the team June 1-4 as a new chapter in jiu jistu history is written. “I feel like I’m not getting better, like nothing I’m doing is right”. A sentiment echoed in Brazilian Jiu Jitsu gyms across the globe. Day in and day out practitioners toil, exerting maximum effort to achieve even the most miniscule gain-because they all know that progress is the goal rather than perfection. But after the continuous exhausting work some people are still left feeling dissatisfied. Whether it’s their performance relative to their teammates’ or merely against a mental image of themselves that they have, it can be frustrating not seeing the progress you desire and work so hard for. And yet…because people are often so focused on the NOW aspect of their respective abilities, it can be easy for them to forget where they started and just how far they’ve actually come. To help visualize this fact, think back to when you first started Brazilian Jiu Jitsu, back to when you first donned your Gi and were still fumbling with how to properly tie your belt. In those days, the bane of many beginners’ around you were the warmup drills. The running, the jumping, the pushups and other bodyweight exercises definitely humbled quite a few individuals. So much so that it became common place to notice people begin coming into class late hoping to avoid the warmup (yes, we noticed you all!). Back in those days when people would think to themselves, “ok this is more than enough running, lets just roll”! However, after only a few weeks of these seemingly torturous exercises something began to happen, their bodies started to adapt and their minds no longer told them to quit-that they really couldn’t do it. But you kept at it and something happened-almost as if by magic. You went from needing to stop and catch your breath after nearly every lap to being able to keep up with your teammates. At first you thought perhaps the running had slowed. But then you noticed that you were actually able to keep up during the pushups and situps drill as well…you couldn’t understand it. In your mind you didn’t look any differently, and you certainly didn’t feel any differently. So when you catch yourself questioning your ability, doubting yourself and your efforts-stop and think about it, you are getting better, everyone who trains is. Stop looking for the HUGE jump and start noticing the small steps. Similar to building the foundation of a strong house; brick-by-brick, your Jiu jitsu is built by multiple small improvements. When looked at individually they may seem small and insignificant, but when viewed at a distance it is easy to see the new you being formed. Bumps and bruises, they’re not a matter of “if” but rather “when”. Seeking relief, many practitioners seek relief from various creams-rubs-and tapes, but often overlook one of the most effective (and cheapest) methods of relieving pain…stretching. Not only can stretching actually improve your performance during workouts, it can indeed preclude many injuries that occur thru strenuous activities. However, not just any kind of stretching will do. Between the two main types of stretching; Static and Dynamic, there are specific benefits to each and specific conditions under which each should be used. Static Stretching is by far the most commonly well known and widely used type of stretching, it involves long, slow and constant movement with the end position being held. The ease of this movement to both demonstrate and execute has led to it being taught to even children in primary school(s). One of the main benefits of Static stretching is its ability to increase flexibility in individuals. The problem occurs however, when people attempt to use Static stretching as a means of warming up before a workout. Think of your muscles as a rubber band, now put that rubber band in the refrigerator for a few hours. When you take it out, it’s pretty stiff and hard to stretch right? The same principle applies to your muscles, they need to be warm before they can stretch and contract like you want. The best time to utilize Static stretching is AFTER a workout, when your muscles are mostly in need relaxation. Your high body temperature coupled with warm and pliable tissue make a perfect environment to increase flexibility, in addition to decreasing lactic acid build up in your muscles. Static stretching allows your muscles to relax, while also fighting off cramps due to dehydration and sweat loss. Standing in direct contrast is Dynamic Stretching. Dynamic stretching is a great precursor to an intense workout, as the movement involved actually primes the body for activity. 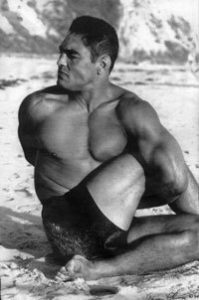 Rather than the “sit and hold” base that comprises Static stretching, Dynamic stretching is done through movement and momentum. Arm rotations forward and backward, karaoke, leg swings…basically the warmup movements in a typical Brazilian Jiu-Jitsu class. Beyond raising your heart rate and increasing circulation, these movements serve to increase pliability in major muscle groups. Remember the rubber band? Now imagine that you take it out of the freezer and slowly begin stretching it out and releasing it. Before long it’s just as stretchable as it ever was, and is none the worse for wear. The movement in Dynamic stretching serves to help loosen muscle and tendon alike, leading to both longer workouts and less injuries. Prior to activity it’s hard to beat Dynamic stretching, the many benefits it offer make it a staple for the avid grappler. Monique Elias is one of the most successful athletes of Alliance, having won the gold medal at IBJJF Worlds in all belts ranks since blue. Although her credentials are impressive, Monique is more than just her gold medals. On and off the mats she is an inspiration and example to all female jiu jitsu practitioners. 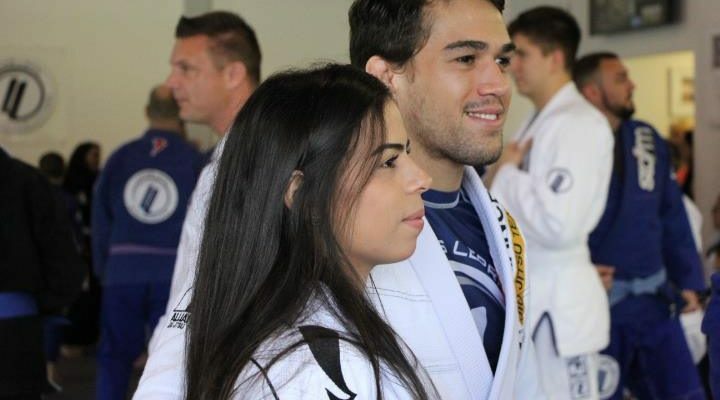 Monique Elias was born in Porto Alegre, Brazil and start training Jiu-jitsu in 2012 after meeting her future husband and professor Mário Reis. After falling in love with the gentle art she made the tough decision to give up her career in modeling. Since then she has been a role model for all girls who train Jiu-Jitsu as well as a great example to all girls who want to become a competitive Jiu-Jitsu athlete. We asked Monique a few questions about her life, career and training. Keep reading to learn more about this impressive woman. 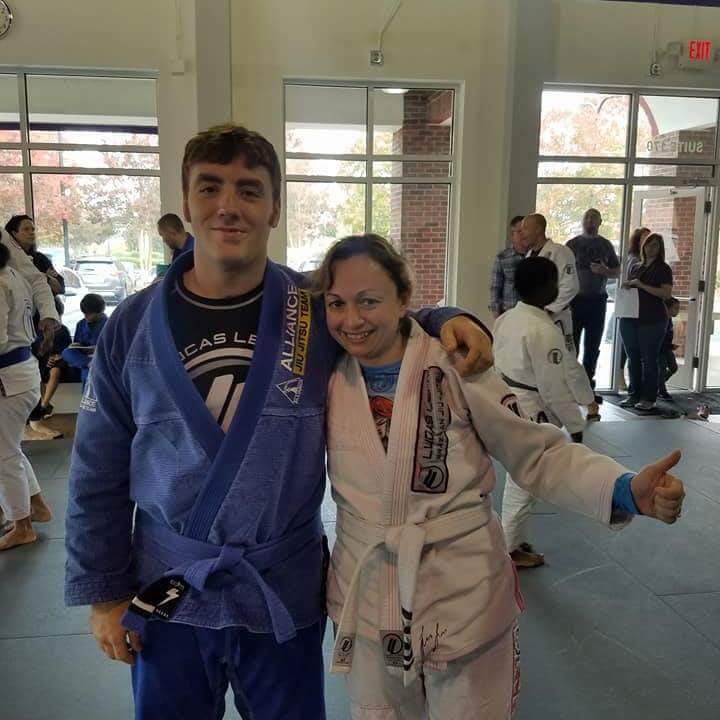 What was it like switching from a casual jiu jitsu practitioner to a competitor and what motivated you to dedicate yourself to the competitions? When I started in jiu jitsu I already had decided in my mind to compete. I believe it was a seed planted by my teacher and husband. I remember accompanying the team to the CBJJE World Championship before I began training seriously. I watched Mario win his weight division and then the absolute division. I saw everything he felt, the gleam of happiness in his eyes after achieving such a feat. I told myself that I wanted to feel that too. It was that day that I knew where I wanted my jiu jitsu journey to go. What is your training routine during the competition season and which championships will you compete in this year? My preparation for the championships includes two jiu jitsu training sessions and one conditioning session per day, averaging about four hours total training. As soon as the doctor releases me I will fight in everything that I can! Staying away for a while has really motivated me to come back stronger! Do you think that social networks like Instagram and Facebook are contributing to the growth of the sport? No doubt! And I would also include youtube. 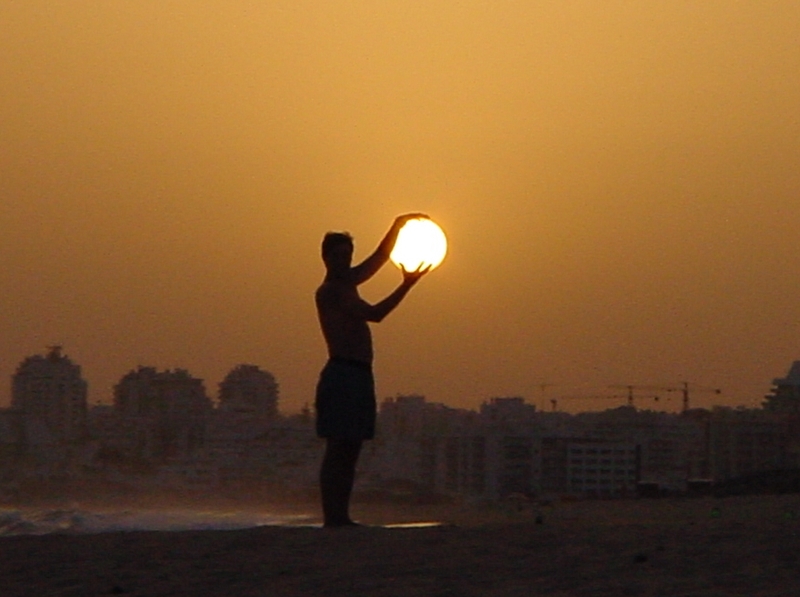 Everything ends up gaining more visibility. I think the sport has even more to gain from the usage of social media outlets. In comparison to men, lower payouts ​​are offered to women with the notion that there is a stronger male presence at championships. In your opinion, is there something in academies that can be improved so that more women have the confidence and desire to compete? As a woman I know that we still face this problem in many aspects. In addition to lower payouts, we also have lower salaries from our sponsors. The excuse is always the same: Women do not gain as much attention and visibility that men do. This is extremely relative. We can influence all genders. I receive messages every day from fans of all ages and genders. My audience is mostly men. Many comment and tag their girlfriends on my social media accounts to show them how much Jiu-jitsu can be for women as well. It is difficult for me to give an opinion on academies because I have trained in only a few different places in my life. In our gym we have a strong female presence. I think that when a girl comes to the academy and sees the many women training it makes her feel more comfortable to give it a try. Having a good teacher who knows how to understand and teach women is a big help. Some seek to be competitive, others want to get in shape and some want a new place to make friends. Understanding the goals of each woman is helpful in keeping them on the mats and training. For example, the competition training that is good for me might not be ideal for a girl who is just there to have fun and get in shape. This also applies to the males at the gym as well. As for confidence for competition? I think that we will never feel 100 percent ready and confident, not even the day of. Confidence is an eternal quest. The secret to sucess is to make the journey fun. When you fall, learn to get back up! Always enjoy and make the best of your time on the mats for they will become some of your most cherished memories! Thank you Monique for your responses! We wish you a fast healing process and hope to see you at the tournaments soon!